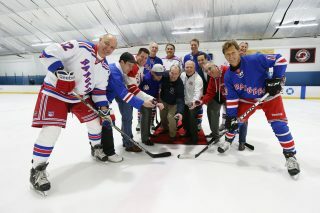 The New York Rangers and Chase along with the New York Rangers Alumni Association hosted a charity hockey game featuring former New York Rangers on Sunday, March 5, 4 p.m. at the Sport-o-Rama in Monsey as a part of the Rangers Assist presented by Chase program. Rangers legends Rod Gilbert, Steve Valiquette, Ron Duguay, Glenn Anderson and Stephane Matteau were on hand with all but Gilbert lacing up for an exhibition game to benefit the North Rockland Youth Hockey Association. Public officials from North Rockland including Supervisors Jim Monaghan and Howard Phillips were also on hand. Matteau and Gilbert shared some thoughts with the Rockland County Times about their Rangers career, the state of hockey and what motivates them to work with young players. Matteau is, of course, most famous for his game-winning wrap-around goal against the New Jersey Devils goalie Martin Brodeur in sudden death double overtime of Game 7 of the Eastern Conference Finals in 1994. He also scored the winning goal in double overtime of Game 3 of that series. Matteau said he visualized the famous goal before it happened and the memory is something he “will cherish for the rest of his life.” He doesn’t like to take too much credit for the team’s Stanley Cup victory, however, as he pointed out that the team had players like Mark Messier, Mike Richter, Brian Leetch and many former champions from the Edmonton Oilers 1980s dynasty playing at a high level. Matteau, who stands at 6’4,” said it is nice to touch base with some former players like himself at events such as the Sunday exhibition in Monsey. Helping kids on their path is a natural joy. “I wish I could do it more often,” he said. scoring the legendary Game 7 goal. Matteau still gets to live out some of his hockey dreams through his son, who shares the same name and has played in the NHL with the Devils, ironically. He currently is in the minor leagues. While Matteau is a large man with an athletic frame, the 75-year-old Rod Gilbert resembles an everyman at 5’9.” But hockey players of his time knew Gilbert as an offensive force. He is considered if not the greatest Ranger player in history one of the top two or three. Gilbert was the team leader and best player in the 1960s and 70s. He is a member of the Hockey Hall of Fame and president of the Rangers Alumni Association. Hockey is the national sport of Gilbert’s homeland Canada and helping the sport comes natural to hockey lifers like himself. He said he had hoped to coach after his career, but the Rangers fell in love with US Hockey coach Herb Brooks after he won the gold medal in the 1980 Olympics and hired him instead. The Assist program is allowing 501(c)3 youth hockey organizations to host charity hockey games at community rinks across the Tri-State area featuring appearances by Rangers alumni. The program was created in response to the damage that Hurricane Sandy caused to local hockey rinks and is designed to improve the youth hockey experience and increase opportunities and accessibility to the sport. The Rangers and Chase also connected with the North Rockland Youth Hockey Association last year after North Rockland came in first place in a fundraising contest. The Rangers and Chase sent several North Rocklanders to Sweden to meet Swede Henrik Lundqvist and train and compete with some youth hockey players from the Scandinavian country.